As anyone who follows my work knows, I'm quite keen on Great War subjects, having already built a Medium Mark A Whippet and a Krupp 21cm Mörser 10. With those under my belt, I felt that it was time to move on to the family of vehicles that spawned the modern tank: the British Mark I. In the autumn of 1915, at behest of the Landships Committee, Little Willie, the first prototype of what would become known as "tanks" was built. There are varying stories as to why these lumbering beasts were called "tanks," but it most likely appears to stem from a code name used to deceive the Germans and it ended up sticking. 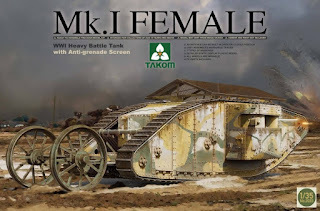 Soon after, in December of 1915, the prototype of the Mark I, Mother, was completed and the first order for 75 "male" tanks armed 6 pounder guns and 75 "female" tanks armed with .303 Vickers machine gun were placed in late-February, early-April of 1916. The distinctive rhomboid shape was designed to help the vehicle cross the ubiquitous trenches that characterized the fight on the Western Front. The armor was relatively thin, ranging from 6 to 12mm, but it was enough to keep out rifle and machine gun fire. 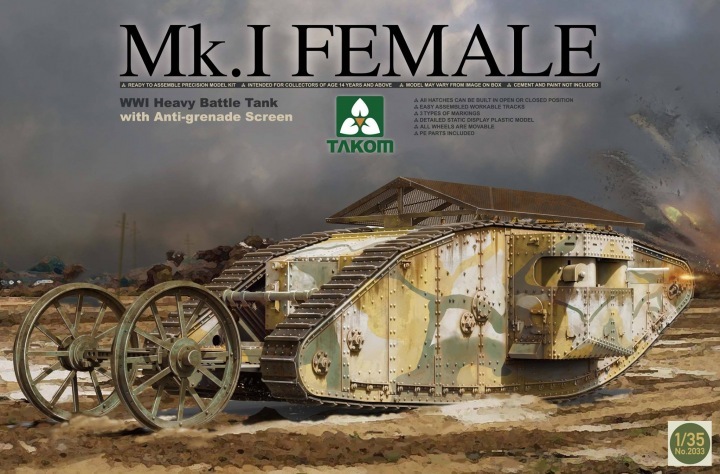 The Mark I made its combat debut at the Battle of Flers-Courcelette in September 1916 (as part of the larger Somme Offensive). Though the kit parts can build up a pretty decent representation of a Vickers machine gun, I thought the addition of some aftermarket brass parts would be nice touch. After a quick search, I found that Aber makes a nice set that has the four Vickers and one Hotchkiss machine guns. I'm not entirely sure the extra effort is worth it, especially for the cooling jacket armor, but the fine details on the muzzle are a huge upgrade compared to the rather chunky kit muzzles. The main hull, made up of various plates, goes together quite nice using the inside of the track frame as a jig to ensure proper alignment of the parts. Probably the biggest fault with the kit lies in this area: the cab is grossly inaccurate. Mark I cabs should extended the full width of the hull to the track frames; the shortened cab was used on the later Mark IV and Mark V tanks to accommodate the use of wider 26" tracks instead of the 20" tracks of the earlier models. The saving grace is that there aren't that many people overly familiar with these vehicles means that it's something that will unnoticed for the most part. The track frames are mirror images of each other and go together well enough, but the number of rollers can make it a little difficult to assemble. As far as the rollers go, I did no clean up on them because once sandwiched between the outer and inner pieces and the tracks added, they're impossible to see. To be honest, it's probably perfectly fine to leave them out altogether so long as their axles are added (these stick out of little holes along the bottom of the vehicle). With the hull and track frames completed, I started on the characteristic steering tail. These were a feature found only on the Mark I tanks and were used as a kind of a rudder to help steer the tank in large radius turns. It was quickly found that these were completely unnecessary and were removed from later vehicles. It goes together without much fuss and the large wheels have poly caps so they can be removed for painting. With a majority of the vehicle completed, the only things left to build are the weapon sponsons and the anti-grenade screen for the top of the tank. I probably won't use the screen because this tank will be painted as D11 "Die Hard," which was damaged just outside of Flers on September 16, 1916. The first Mark I tanks were part of D Company and C Company of the Machine Gun Corps and only tanks of C Company were outfitted with screens.